Pussies Galore is a Brisbane based inner city small rescue. We have a no-kill policy. Our animals are rescued from many situations and may even be overflow from other rescue groups as we often pool together when needs arise. 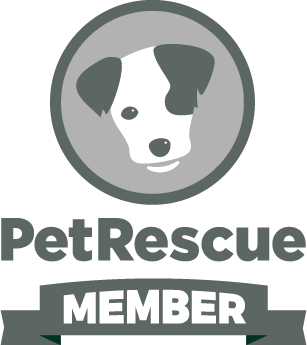 Education and responsible pet ownership is an important part of our mission. The latest addition to our mission of saving the world, one cat a time, is our Cat Cuddle Café located in Red Hill. 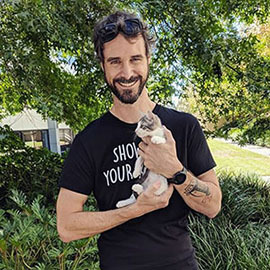 Here cat lovers can connect with some of our rescued cuddle stars and other cat lovers over a delicious cuppa and some treats. 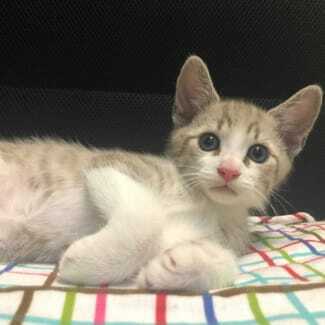 Chestnut the kitten is ready for his forever home. He is an adorable little man, who is a very unique colour. He is playful and sweet and purrs almost non stop. 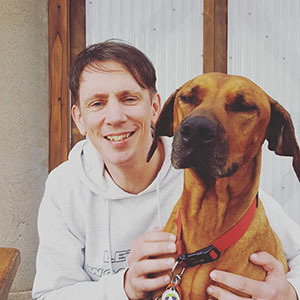 He adores humans and will tap on his foster Mum’s leg when he wants to be picked up. Chestnut is pretty playful and loves his ball run, scrap bits of paper and feather wand toys. He loves to play with his sister Blackberry. Chestnut is in a foster home with a human child. He would be very happy in a home with gentle children. 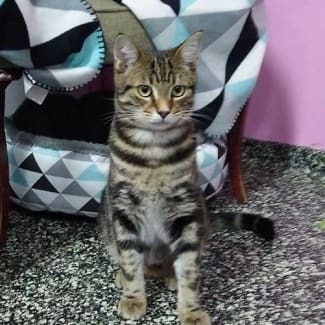 Chestnut is only a a baby and he will need another young and friendly feline in his forever home. If you are looking for double the love, Blackberry is also looking for her forever home. Lew could not be any cuter. He is such a very sweet natured boy with a purr to match any lawn mower. That purr starts up before you even enter the room. He adores pats and loves to listen to your stories whilst snuggling up to you. Lew has a fascination for how water goes down the plug hole. He knows somehow that is connected to the drain hole in the bathroom floor. He has spent quite a while studying this. In fact when our plumber came today, Lew was very happy to pass on his insights. Lew came to us in a batch of 12 kittens, all related. Lew and 3 of the other kittens are now de-sexed and ready for adoption. 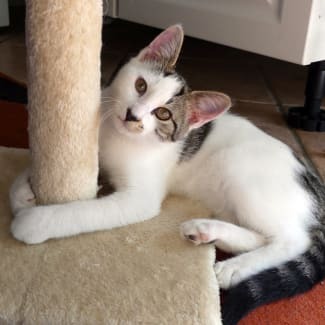 Lew loves everyone and would do well with another feline in his new home, especially one of his siblings. Augustus is a sweet, funny little soul who after a rocky start in life has really blossomed into a cool cat. He started life as a street kitten which meant that he was very nervous of humans when he first came into foster care (you can change his back story appropriately obviously I don't really have all the details). With some patience and TLC however he has come so far and is now a perky, curious kitten who is relaxed and enjoying life. Gus is still a cautious cat and not a fan of lots of bustle or noise so would suit a home where he is the only cat or with a calm older animal and older children who can go slow and steady with him at first. His favourite thing in life is food and while his first reaction when faced with a new situation is to find somewhere to hide he quickly gets over it if there is a food reward available. All you really need to win this little boy's love is a tin of wet cat food or some BBQ chicken and he will be your best buddy eating our of your hand within minutes. Like most kittens Gussie has a lot of energy and loves to run and play whether it's chasing a ribbon toy or wrestling his sister but the height of fun for him is shredding boxes and pushing the pieces under any closed door he can find. 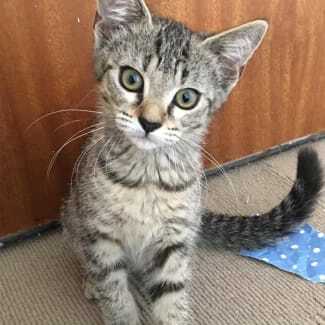 Little Sheldon was found at 10 weeks old, living with Mumma cat (Bernie), his sister and two brothers. They were living under a restaurant feeding off scraps left by guests and staff. Having started life as a street kitten, Sheldon is still wary of people. He is learning to accept strokes and pats in exchange for food. Sheldon will need a very patient and loving forever home. It will take him quite some time to settle in and to trust his humans. Sheldon really loves other cats and looks to the more confident cats for guidance. Sheldon has become friends with our big boy Salem. He will head bump and kiss Salem any chance he gets. If something spooks him, and Salem is close by, he runs to him for reassurance. Sheldon will need a confident and friendly feline in his forever home. Currently at the Cat Cuddle Cafe, Red Hill: Little Hazel has had a rough start to life. 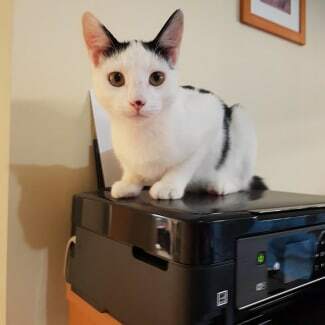 She was found as a stray with her Mum and siblings. Going from street life to one of a domestic house cat is a big change. Hazel is still learning that humans are not so scary and that pats and cuddles are nice. She will still run away from her foster mum but is starting to accept pats more and more. Hazel loves other cats, she is happiest when she is hanging out with her siblings. We believe Hazel would be happiest with another friendly cat. A resident friendly feline could really help this little girl come out of her shell.